MOST ANY place can radiate a certain amount of cheer under sunny skies. It is in inclement weather, when the thrumming rain humbles the ferns, that a house reveals whether it serves or whether it does not. On this day, west of Gig Harbor on Key Peninsula, it pours so thoroughly an ark appeals. 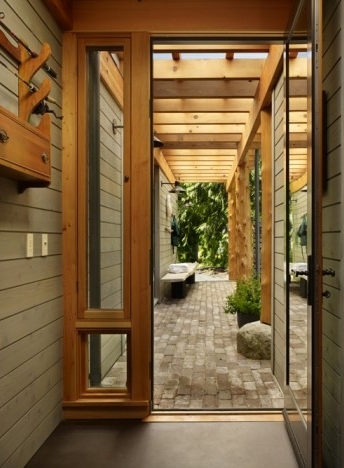 That is, until you step onto the covered, cedar-pillared walkway of this new family getaway home. It welcomes like an outstretched arm. It promises comfort and protection even 30 feet away from the front door. These kids are grown people, 29 to 40. They have kids. But memories made in old cabins with knotty-pine walls spread deep roots. These go back to 1981, when the couple bought the nearly-eight-acre, medium-bank waterfront property (with its own beach) for just such purposes. What this family needed was a new heirloom for their old memories. And for that they chose David Vandervort and Mike Butrim of David Vandervort Architects in Seattle for their expertise in general and their green-building expertise specifically. “We really wanted the new house to have a cottage feel, be comfortable and relaxing for the two of us, but be expandable, low-key, low-maintenance and have a low impact on the site,” Janet says. Boy, does it ever. The new 3,200-square-foot house is Leadership in Energy and Environmental Design (LEED) Gold certified, no easy feat. The structure, crafted by Joe’s Bay Construction under the direction of Hank Appleton, echoes the informal-cottage legacy of the original. Four gabled pavilions are connected and defined by circulation corridors and exterior space. Each pavilion serves a different function: living, master, guest, garage. And each has views of the water and Mount Rainier. Materials are stone, wood, steel and concrete. The walls and ceilings are hemlock, “and there’s a lot of it,” Janet says, figuring that about 65 percent of the wood for the project came from trees on the property, either thinned or felled by storms. The old house was deconstructed by the ReHarvest Center of the Metropolitan Development Council in Tacoma. The bathtub, refrigerator, stove (a 1926 Magic Chef that had belonged to Janet’s grandmother) and the knotty-pine walls were kept, refurbished and reused. Landscape architect Ken Philp, along with Scott Holsapple, worked with Vandervort to create a house that lives to the outside, much like the former beach cabin. Inside, Natasha Wallis melded a few new pieces with family treasures. In one instance she renewed an old Queen Anne chair with fabric the couple bought on a recent trip to Turkey. In another fabric treatment, every bed received the same plain white cotton-duck headboard from Pottery Barn. Wallace then made each individual with block-print fabric wraps from Peter Dunham Textiles of Los Angeles. Overall, the usage of rust, cream and teal are an elegant take on the brassier red, white and blue. The carefully considered project — 1 ½ years in design, 1 ½ in construction — was finished in 2009. And now the family’s year-round vacation home among the wineries, farms and artists’ studios of Key Peninsula is coasty and toasty. “The kids all love it,” Janet says.